Eric Holthaus wants to shed light on climate change with help from the internet. He's using crowdfunding website Patreon to find money and ideas from those who care about our planet. "I want to bring that story directly to you, and help you decide what I should focus on. 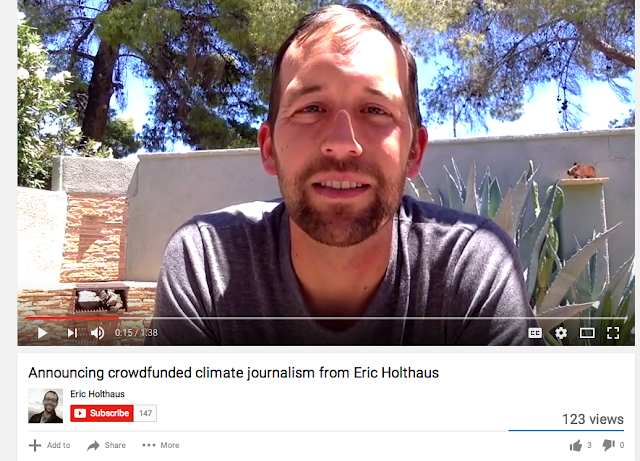 This is crowdfunded, crowd-directed climate journalism," Eric posted on his Patreon page. "Since climate change often doesn't get the attention it deserves by the media, I want to give you a chance to drive my coverage. "If you care about coral reefs, I'll cover coral reefs, and interview the world's coral reef experts. If you live in California and you're interested in how climate change is boosting the risk of wildfire, I'll investigate. Bottom line: I want to tell the stories you care about most."